15" wide x 10.7" height. approx 1.4" depth. 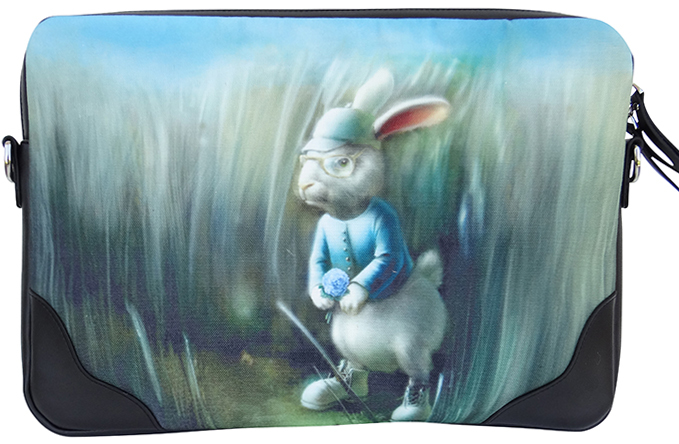 Exterior body: PLIA's custom rabbit illustraion of Higgins. Cotton twill with black leather trim. Take your cue from the fashion pack, staying stylish with a cool and practical laptop bag. Silver zipper and zipper pulls. Exterior back open slit pocket. Interior: Crafted of mauve silver custom quilted high performance satin. Dustbag and detachable seatbeltshoulder strap included.